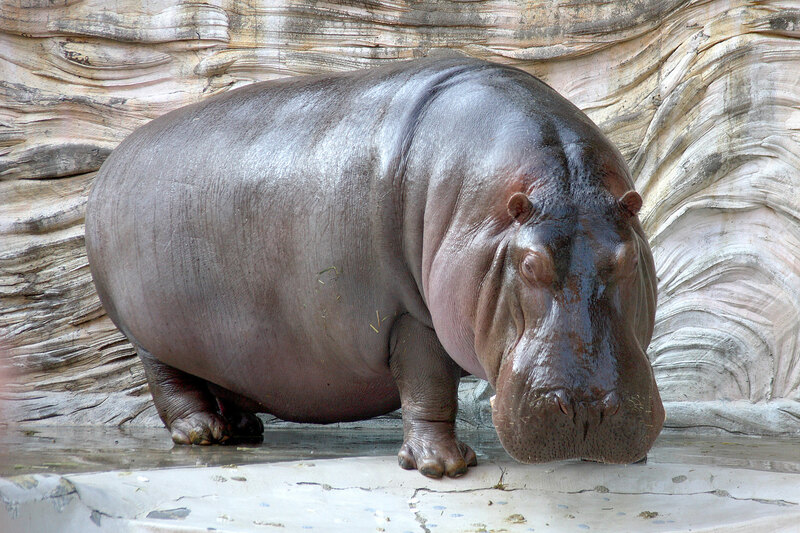 The hippopotamus (Hippopotamus amphibius), or hippo, is a large, mostly herbivorous mammal in sub-Saharan Africa, and one of only two extant species in the family Hippopotamidae (the other is the pygmy hippopotamus). The name comes from the ancient Greek for “river horse” . After the elephant and rhinoceros, the hippopotamus is the third-largest type of land mammal and the heaviest extant artiodactyl. Despite their physical resemblance to pigs and other terrestrial even-toed ungulates, their closest living relatives are cetaceans (whales, porpoises, etc.) from which they diverged about 55 million years ago. The common ancestor of whales and hippos split from other even-toed ungulates around 60 million years ago. The earliest known hippopotamus fossils, belonging to the genus Kenyapotamus in Africa, date to around 16 million years ago. Hippos are recognizable by their barrel-shaped torsos, enormous mouths and teeth, nearly hairless bodies, stubby legs and great size, adults average 1,500 kg (3,300 lb) and 1,300 kg (2,900 lb) for males and females respectively, making them the largest species of land mammal after the 3 species of elephants and the white and Indian rhinoceros. Despite its stocky shape and short legs it can easily outrun a human, being capable of reaching 30 km/h (19 mph) over short distances. The hippopotamus is one of the most aggressive and unpredictable creatures in the world and, as such, ranks among the most dangerous animals in Africa. Nevertheless, they are still threatened by habitat loss and poaching for their meat and ivory canine teeth.